Low Fuel Price! Free Coffee and Donuts - Second Saturday of Every Month! Olds-Didsbury Flying Association, ODFA, is hosting a fly-in coffee and donut meeting the second Saturday of every month. Our next fly-in is being held on March 9, from 9:00 am to 1:00 pm local time. We will be offering 100 LL and Jet A fuel from our pumps (Debit, Mastercard or Visa) at a discounted price during the fly in. If you have any questions, please contact Ed Shaw at 403-701-1600 or by email. Fuel is available through self serve Debit Card, Master Card or Visa card. As of January, 2019 the fuel price for AVGAS 100LL is $1.36 per litre and Jet A is $1.26 per litre. 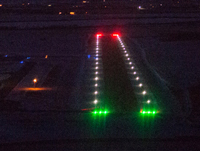 LIGHTING UP THE RUNWAY LIGHTS! Attended by Dignitaries and Guests, the official opening of the Olds-Didsbury Airport new LED runway lights was held on December 12, 2018. Invoices can now be paid on-line or you can continue to pay by cheque, or cash. Make sure your name and amount is in the email and any other information that is needed to process the payment. If you have problems you can call Randy at 403-586-4302. Mail your cheque to the address shown on the Contact web page. Cash payments can be made during our association meetings. If you are using the self paced study program for recency requirements as per CARs 421.05 (2) d, it is available in the Aviation Safety Letter, see the 3/2018 issue. This study satisfies the 24-month recurrent training program requirements of CARs 421.05 (2) d. You can reference the Transport Canada Aeronautical Information Manual (TC AIM) to assist with the answers. Renewal of your ADB should be done 90 days before it expires. Information and forms can be found on the Transport Canada Website. Board members can be found on this website page. Meeting minutes are available by logging on to the website. Please attend the next flying association meeting or contact us to find out the password. Some members went on another fishing trip in 2012 to Sturgeon Landing. There were five planes and 15 people. See the photos in the gallery. Our fishing trip in 2011 was to Sturgeon Landing just on the Saskatchewan-Manitoba border. See the photos in the gallery.